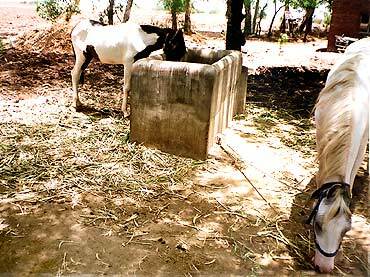 Kanjibhai Chavda (46), a Dalit schoolteacher from Akru village, about 115 kilometers from Ahmedabad, has been gladly suffering a royal three-generation-long addiction -- breeding and selling horses! Arvind J Bosmia traveled to this small village in Gujarat to bring forth this fascinating story. From making saddles and horseshoes, Kanjibhai's grandfather Mangalbhai Chavda got hooked to horses itself -- when pleased with his knowledge of the animal, a local Rajput landlord gifted him a mare. Since then their home in Chamar Vas of the village always has a horse in the stable. It continued with Kanjibhai's father as well. Kanjibhai's son Ajit (22) is so engrossed with the craze, that he discontinued his education after 10th class and took up full-time his great grandfather's profession of saddle-making. They had begun with Kathiawari breed of horses like Mani, Phulmal, Beri, Manki and Patti. But for the past ten years, Kanjibhai has concentrated on the Marwari breed, as there is a well-developed nationwide market for the breed which fetches a handsome price. Ownership of two outstanding stallions gave him a roaring studding business with calls for covering mares coming from far away as Chotila and Bhuj. He charges Rs 2,500 per mating session, plus transport expenses. At first he owned Sagar, a pure Marwari breed stallion who sired so many high quality offsprings that it established Kanjibhai's name as a breeder of substance. The present stallion named Uday, a cross-breed with a Marwari father and a Kathiawari mother, has already sired over 400 offsprings while covering mares all over Gujarat. Kanjibhai narrated with pride how Uday had Kathiawari ears and gait and the looks enhanced by the great Marwari height. Whenever Bhahadursinh, a Rajput landlord from Ishwariya village wanted to cover his mares, his sole choice was for Uday! Commenting on the characteristics of various Kathiawari breeds, he told rediff.com that Mani found in areas near Chotila has flat nose and strong strides, because of the rocky terrain. Beri, meaning 'deaf' in Gujarati, is so self-absorbed that it never notices who is the rider. As it never panics even under cannon fire and is impervious to injuries, it used to be a great favourite in the cavalary. Manki and Patti are among the most rider sensitive breeds and only a highly-skilled rider can ride them. Calling Manki and Patti 'mind-readers,' he revealed that they are so deeply attached to their rider-owner that they would find difficult to survive 24 hours after their death! However, sometimes a single horse can turn out to be a dead investment. Recalling his experience, he told rediff.com about how he had bought a hi-breed Marwari mare with a Punjab breed father from Babban Sheikh in Kapadvanj for Rs 80,000. Just after 15 days, a scorpion bit her. He consulted a veterinary doctor at Ahmedabad when local remedies failed. But the mare developed diarrhea in reaction to the medicine administered by the vet. She had to be hospitalised for ten days at a veternary hospital in Anand. It cost him Rs 10,000 in ten days. As if this was not enough, after return from Anand, she had worms in her stomach, putting him down by another Rs 5,000. In exasperation he sold her off to a dealer in Sarangkheda for Rs 1,32,000 on credit. The dealer was in total panic, when the mare was again down with a severe case of cold. Yet he clung on to her because she was a nukri (one with ultra-white complexion and black eyes commanding a huge premium in the market). According to Kanji, no genuine horse-lover can go to sleep without the scent from the horse stables in his nostrils. He would not miss his wife Ramilaben even if she is away for six months, but he would feel distinctly uncomfortable without a horse tethered in his stable. Why give a horse higher priority over a wife? Kanji replied that a man cannot have a more loyal, caring and loving companion than a horse. Reflecting a belief prevalent among Indian horse-lovers, Kanji revealed that the horse keeps track of all the travails of his owner. According to folktales, during the night, it's believed that he is in touch with Lord Indra through Urishrava, the divine horse and relays the difficulties faced by his owner -- and Lord Indra finds instant remedies. Thus a horse is a talisman against calamities, as per the legend in the area. For Kanji, Shalihotra Shastra by Nakul, one of the five Pandavas, is the last word on anything that has to do with horses. Thus without any touch of irony, he told this writer that there is caste-based distinction among horses and how to tell one from the rest as per the criteria mentioned in Shalihotra shastra. He always prefers a Kshatriya or a Brahmin horse. The Brahmin horse enjoyed second preference because it was too cool and sensitive and had to be used only for ceremonial purposes because of the auspicious signs carried by it. Some Brahmin horses were fit to be ridden by saints only. May be Kanji is able to accept a Brahmin horse so naturally because his family is treated with respect in this Brahmin dominated village. Whether Brahmin, Rajput or Bania, the bridegroom from Akru will always ride a horse from Kanji's stable and the service is provided free. According to him, he faced no discrimination because of his caste. Instead, he has been honoured for his knowledge and dedication by fellow horse-lovers. He is a known name among horse-lovers. He declares that horse-lovers are a caste by themselves having nothing to do with the caste they are born into. Their passion for horses decides their caste. With Ajit fully involved in saddle and horseshoe making, horses will be a full-time passion and royal profession for the fourth generation of this Dalit family.